The time between the archival of a game and the start of the next game is generally quite large. This is because there are always a lot of different propositions and requests for the new map, and someone has to make a scenario trying to meet all those requirements. You can imagine this isn't done in a jiffy. Therefore we'd like to encourage all people to consider setting up a nice new game and providing a savegame from which a new Publicserver game (or possibly also Pro_Zone game) might start. 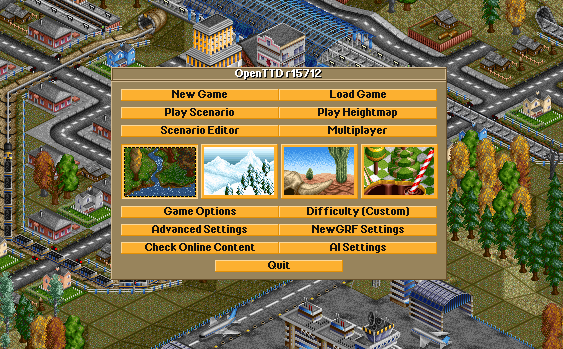 Before you actually start creating a map, you have to choose from the main OpenTTD screen the newgrfs you want the new game to use. Subsequent modification may work, but it may also introduce all kinds of bugs which can render a game unplayable. When choosing grfs, mind that some grfs require a certain climate - especially important for industry and train set grfs. add ONE grf for a train set, unless you know what you're doing. Entries marked with * are entries where more than one grf may be chosen. In all other cases stick with one grf. You can pick your grfs from our grfpack or from the ingame content distribution BaNaNaS. Make sure that you have the latest version of a GRF from BaNaNaS and try to avoid grfs from the z_obsolete folder in our grfpack, as they are obsolete for a reason. Also included in our grfpack are 6 spacer GRFS, shown below, which should be used to keep the grf-list neat and ordered. Now, check the grf list in a game whether there are any incompatibilities or requirements like one grf comes before another - fix those. At this stage you also might want to set grf parameters for some grf. 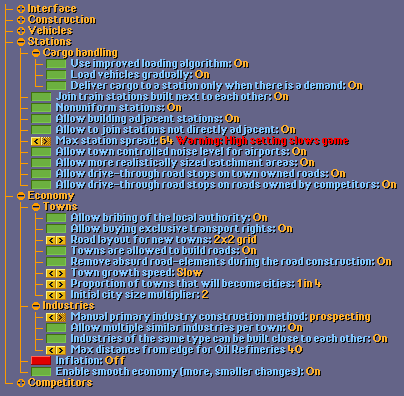 Most road, town and vehicle sets take grf parameter to modify their behaviour. Have a look at the supplied readme files for details. E.g. the 2cc train set allows to control the pricing and running costs as well as the choice of available trains via grf parameters. 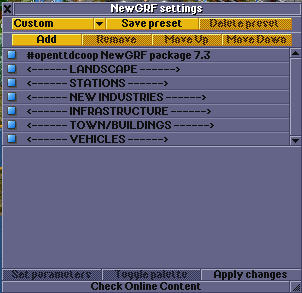 Use the grf presets to save your selection of grfs for future reference - it's a nice selection which you may want to refer to later :). Don't forget to apply the changes you made. Allow building on slopes and costs: On. Allow terraforming under buildings, etc: On. Allow removal of more town-structures: On. Pathfinders: as shown in the image. Forbid 90 degree turns: On. Autorenew vehicle when it gets old: Off. Disable servicing when breakdowns set to none: On. New orders are 'non' stop by default: On. Not really a server setting, but should still be on at every player, including you. Enable multiple NewGRF engine sets: On. Stations tab: exactly as shown, with the exception of noise levels. Manual primary industry construction: anything but off. 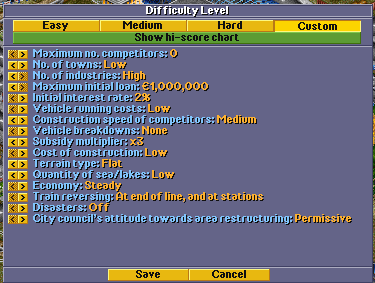 Max distance from edge for refineries: Anything between 20 and 40. City council's attitude towards area restructuring: Permissive. Again, save those settings and then, finally, we can go to actually creating the game. Map size: a map should not be smaller than 256 tiles squared and should not have more than 1 million tiles at most. Other terrain options are completely up to your liking. Mountainous and smooth will not result in a very hilly countryside, though. Rather make the map not too smooth, if you want some contrast. Our usual starting date is 1st January 1950. But this may be varied, e.g. if with the 2cc and egrvts grfs vehicles become available way before this date. 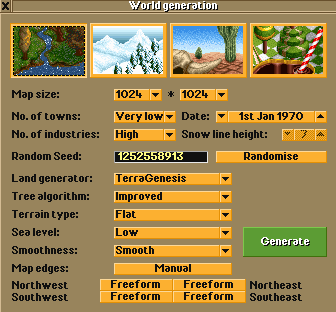 If you want a more custom made map, feel free to use the scenario editor. Keep in mind though that you have to upload a save file, not a scenario file. This means you'll have to play the scenario first and upload a savefile of it. Sadly the editor does not allow prospecting of one indsutry type. This can be solved by playing the scenario in singleplayer, get some money from the cheatmenu and prospect them there. You may also certainly look around in the scenario section of the forums or the scenario wiki and shop around for a good map which might be modified a bit to suit your - and our - needs. Mind also, that we like to play our games without any of the options in the cheat menu activated - with the possible exception that money might be cheated for certain scenario purposes. All rules on how to make a good game are, of course, only rules in so far, as they serve well in 98% of the cases. There is always the odd occasion where one well-established game creation rule is rather not suitable. But if you bend those, be really sure that you know what you do :) - they need a sound explanation. Now you have your map, you might want to set up boundary conditions, such as a fixed train length, gametype or game requirement. You can also add a small story or map explanation, to detail the rules used. Please put these condition somewhere on the map in signs, preferable in a lake. Now before you save the game, please put the camera fully zoomed in above a lake. If you put in any boundary conditions, make sure the camera is above those. The camera position when you save your game will be used for the entire game and will also be the place for the message board. A zoomed out state here is not desirable as it will make joining for slower computers way more difficult, if not impossible. If you have finished building a scenario, you can upload it to the ready-to-start maps collection page with a suitable description (an example entry exists). 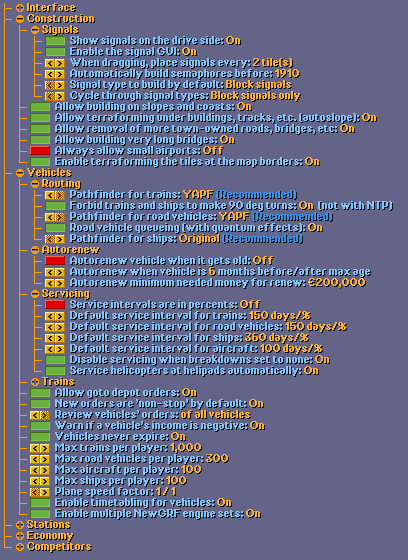 You can ask a member at the #openttdcoop channel on irc to review your map and if it is ok, chances are good that we add it to the server for inclusion in the next game. You can also ask us for some feedback on irc when you are unsure about some of the above points! This page was last modified on 18 June 2017, at 21:19.